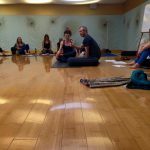 Take your personal practice and understanding of yoga and meditation deeper with Pete’s Morning Intensives. The power of his series is that each class is designed and sequenced to build on previous classes. You will experience profound growth and meaningful connection of your mind, body and spirit. Or maybe you are looking for a quick, effective jump start to your practice that needs a bit of spark and inspiration. Either way, Pete’s mix of vinyasa and Forrest yoga, taught with heart and compassion, will make you sweat, smile and leave feeling restored and grounded. All students of yoga are welcome to participate; you do not have to be a teacher or teacher trainee to attend. If you are already a certified yoga teacher Pete’s Intensives will refresh your personal practice and revitalize and enhance your teaching skills. These intensives are part of Lighting the Path Teacher Training and open to non-trainees. They qualify for Yoga Alliance Continuing Education Credit hours. 25% off drop-in rate for Pete G LTP Teacher Training graduates, with proper credentials. Please contact a Yoga Tree studio to register for this special rate.